Only within a week’s time, Shillong Lajong FC tasted two back to back victories over East Bengal FC on the 24th April and 1st May respectively. The match which was played out on the 24th April was the last home game of the I-League which saw the team finished 6th and ensured a spot in the next season of the I-League. However, coming back to last Sunday’s game, which was the first leg encounter of the revised Federation Cup Campaign and a young Lajong squad clearly dominated the show winning by 2-1 with goals from youngster Chinglensana Singh and Brazilian Fabio Pena Henrique. Thangboi Singto and his troops couldn’t have hoped for a better start to the campaign this year. The team then departed for Kolkata the very next day after Sunday’s victory and kicked off their first training prep in Kolkata on Tuesday. The temperature in Kokata is as high as 37-40 degrees, and this might pose to be a big challenge for the boys from the hills as the kick off time is slated for 4:30pm. East Bengal will look to bank on home advantage and also get back to winning ways under the guidance of their foreign coach Trevor Morgan. The top goal scorer fame, Ranti Martins was unable to find the net against Lajong in Shillong and will certainly be hoping for a better luck this time at his own home ground. The Lajong backline has proved to be immensely tight to get past for many top forwards and attacking players at East Bengal. Singto believes that the boys will continue to stay strong at the back and his attackers to give a much improved and confident performance in front of goal. 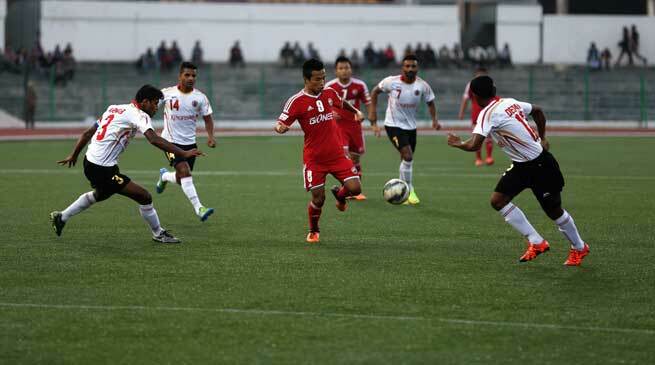 The Lajong gaffer is in fact happy that goals have been coming in which was initially a big problem for the team. Post April the matches that Lajong have played be it the recently concluded I-League or the first match of the Federation Cup, Lajong have created many chances as well as converted those opportunities into goals. “Our away record has not been up to the mark this year and I hope we improve it with our first away game of fed cup on Wednesday . Lajong may have the advantage over East Bengal with an aggregate of 2-1 but East Bengal’s Do Dong has given his side the away goal. It will be a tight contest between both sides but East Bengal has a good home record against Lajong. Head Coach of East Bengal who is not having the best return to the Club with two consecutive losses against Lajong will hope to redeem himself and ensure the Red and Gold progress to the semi-finals of the Hero Federation Cup 2016. An interesting encounter awaits in Kolkata as both teams will give their best to progress in the Competition.